weight loss | Dare Greatly! This sounds like a lot of whining, huh? That isn’t the point of this post. The point of this post is HOPE. Want some? I’ve got some to spare for you. Why? Because most of us have that “extra” that we’d like to get rid of. What I’m suggesting isn’t going to be easy. It isn’t going to be a magic pill that you take every morning with your milk chocolate mocha and donut and the pounds simply melt away. Its going to be hard work, but you’ll love yourself for doing it. Five pounds a month isn’t all that much, but if you talk to everyone who has ever lost the weight and kept it off (and I know you have talked to them), they will tell you that long-term weight loss is the way to go. The reason is because it means that you’re changing not only your scale readout, but also your body, mindset, and metabolism. The first thing I did was go gluten-free. Yes, yes… I know everyone thinks that it is simply the latest excuse going around. As someone who started losing the moment she stopped ingesting this crap I suggest you try to convince someone else. What’s more, I don’t have the joint pain that I did. I don’t have the moodiness that I did. I don’t have the apathy that I did. Notice any symptoms that might be you? I sure did. So what happens when you get rid of those food intolerances? You body tries to come back to normal. It took MONTHS, but I’m proud to say, I’m happy. Yeah, I know. You ARE happy. Lie to someone who hasn’t been there. You have moments of happiness and optimism, but you live in a drudgery of just making it through the day. I now live in a place of optimism and positive outlook and the only real difference in my life is the gluten. Are you gluten intolerant? I have no idea. It might be something totally different, like dairy or nuts or… Play around with your diet and find out. Before you throw what I’m saying out the window, try it. One week just cutting back on the gluten was enough to convince me, but everyone I talk to, says give it two weeks. Two weeks of cutting something out of your diet? You’ve done stupid fad diets for longer than that. You’ve given up sugar for longer than that! Haven’t I done that stupid heart healthy diet too? Grapefruit every blessed morning? Bleck! I HATE grapefruit. All that being said, I now get to the hard work phase (as if giving up gluten is easy, that crap is in EVERYTHING!). Does anyone know what these are? The two smaller ones are kettle bells. 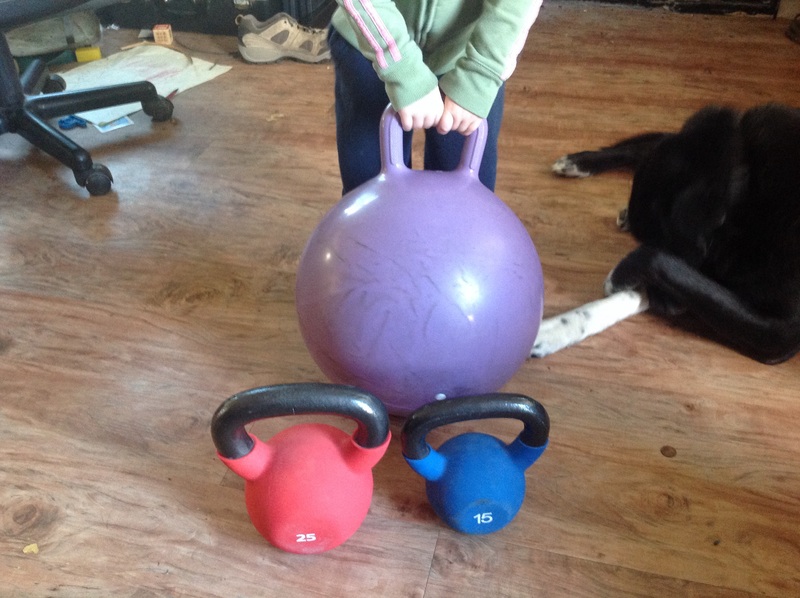 (The big purple one is a bouncy ball that BG thinks is her kettle bell.) The little puny one is mine. The not much bigger one is CC’s. I’ll let CC tell you about his experience. I’m telling your about mine. My kettle bell weighs 15 pounds. BG weighed more than half that when she was born! I use a fifteen because my wrists aren’t strong enough handle a heavier one without hurting myself. Eventually, I will move up to the 25 pound (red) one, but for now I use the little one. They make smaller ones for those of you who need something even smaller. Here’s the deal. Kettle bells are NOT a NEW thing. The Russians have been using them for a VERY long time with huge success. You DO NOT have to do endless reps. You DO NOT have to do impossible weights (15# remember!). I DO NOT sweat when I do mine (big issue for me; I HATE to sweat). What you DO HAVE TO DO is not drop it on your head or foot! These are solid iron. Take the time to research how to do the exercises correctly. I know you know someone who is doing this, but are they doing it correctly? Probably not. Go online and look up a guy named Pavel Tsatsouline. This guy might be weird, but he knows what he’s doing. Click on his name to go straight to his website or hit YouTube for videos of him doing his thing. Since I’ve started doing kettle bells, the fat is melting off me. (Yesterday was the start of week 2 and yeah! I’ve already noticed a HUGE difference.) I don’t know how much I’ve lost because they don’t really make an affordable scale that will weigh me, so I don’t have one (the five pounds a month thing is from the doctor’s office). I do know that since I’ve started doing kettle bells, my pants are starting to fall down and my shirt no longer tried to pop a button over my belly when I sit down. I can SEE the difference in the mirror. I do recommend that you do some serious stretching after working with kettle bells. It seems to help with muscle soreness. Yoga has been my friend for years and I find that combining it with kettle bells is a wonderful synergy, but FIND WHAT WORKS FOR YOU!